What baby carrier is best for breastfeeding? Whether you’re a new mum or you have older children you may wish to use a baby carrier whilst breastfeeding. So obviously you want to know what baby carrier is best. Breastfeeding an infant usually requires them to lie horizontally in order to latch and feed. After a little while you can find this puts an enormous strain on your arms, so in those early days you might find it useful to have a carrier to help support their weight. While lying horizontally to feed you will need to support your baby’s head and neck as they won’t yet have the muscle tone to support themselves. This means that initially a baby carrier is used as an aid to support weight rather than a hands-free nursing experience. When your baby is a little older and can support their own head you should be able to carry hands-free. So, why use a baby carrier? Although it isn’t totally hands free to begin with you will gain one hand to use for pushing the trolly in the supermarket, passing your toddler a snack or a toy, or most importantly, lifting that much needed cup of tea while it’s still within drinking temperature! 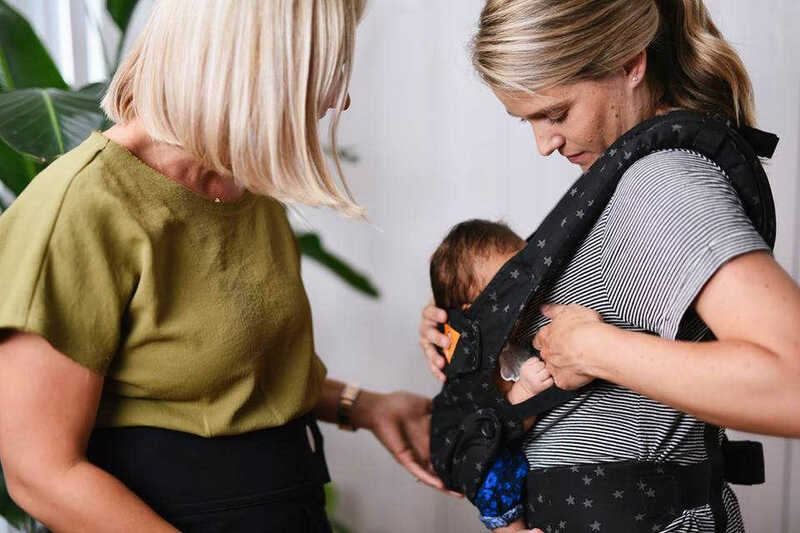 When your baby gets a little older, is able to support their head and feed in an upright position you can use the carrier to feed hands-free once you have your baby latched. So, what should you look for when choosing a carrier to breastfeed in? When using a carrier to support your baby whilst feeding you generally need to be able to adjust the height of the carrier up and down to get the best position to achieve both a good latch and the best position when not feeding. How the carrier can be adjusted is therefore really important. Some carriers, like the Lillebaby Complete, can be adjusted both from the front of the carrier and the back. This makes it much easier to loosen and tighten the straps as required to move your baby into the best position to feed. Other carriers such as the Tula can only be adjusted at the back, which can make it awkward to loosen the carrier enough to lower it to feed. Another feature you may find useful in a baby carrier whilst feeding is a hood. This can provide additional cover if you feel feeding in the carrier leaves you exposed. Carriers like the Lillebaby Complete, Ergobaby, Tula and Connecta have hoods as standard. The Lillebaby Complete also has a head support which can provide additional height in the carrier to help keep mum covered, whilst being elasticated so as not to interfere with a good latch. Please remember to always adjust your baby back into a fully supported position within the carrier when they have finished feeding and to remember to support baby’s head whilst they are too little to do this themselves. A baby carrier is a fantastic tool to support you on your breastfeeding journey, however please ensure you always follow the HANDS principles for safe carrying. Read More: Why use a baby Carrier?